Former secretary of state Henry Kissinger has been hospitalized after a fall in his home, New York-Presbyterian/Weill Cornell Medical Center announced Tuesday. He is expected to be discharged this afternoon, the hospital says. The 89-year-old political scientist served under Presidents Nixon and Ford as both national security adviser and secretary of state. For decades since, he has remained an influential voice in foreign policy debates; President George W. Bush turned to him for advice on the war in Iraq. NEW YORK â€” Former Secretary of State Henry Kissinger has been admitted to a New York City hospital for observation after a fall in his home. NewYork-Presbyterian Hospital says in a statement that Kissinger entered the hospital on Tuesday. The hospital says the 89-year-old ex-diplomat was expected to be discharged later in the day. It declined to say how he fell or what his injuries were. Kissinger served under presidents Richard Nixon and Gerald Ford. He was awarded the Nobel Peace Prize in 1973 and the Presidential Medal of Freedom in 1977. What i was hoping... but he seems to be a vampire/werewolf. we need silver bullets AND a wooden stake. Henry Kissinger: "If You Can't Hear the Drums of War You Must Be Deaf"
NEW YORK - USA - In a remarkable admission by former Nixon era Secretary of State, Henry Kissinger, reveals what is happening at the moment in the world and particularly the Middle East. Speaking from his luxurious Manhattan apartment, the elder statesman, who will be 89 in May, is all too forward with his analysis of the current situation in the world forum of Geo-politics and economics. "The United States is bating China and Russia, and the final nail in the coffin will be Iran, which is, of course, the main target of Israel. We have allowed China to increase their military strength and Russia to recover from Sovietization, to give them a false sense of bravado, this will create an all together faster demise for them. We're like the sharp shooter daring the noob to pick up the gun, and when they try, it's bang bang. The coming war will will be so severe that only one superpower can win, and that's us folks. This is why the EU is in such a hurry to form a complete superstate because they know what is coming, and to survive, Europe will have to be one whole cohesive state. Their urgency tells me that they know full well that the big showdown is upon us. O how I have dreamed of this delightful moment. " Mr Kissinger then added: "If you are an ordinary person, then you can prepare yourself for war by moving to the countryside and building a farm, but you must take guns with you, as the hordes of starving will be roaming. Also, even though the elite will have their safe havens and specialist shelters, they must be just as careful during the war as the ordinary civilians, because their shelters can still be compromised. " 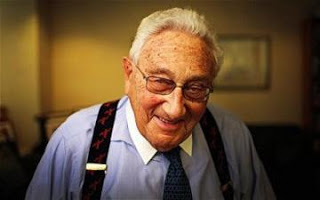 Mr Kissinger, carried on: "We told the military that we would have to take over seven Middle Eastern countries for their resources and they have nearly completed their job. We all know what I think of the military, but I have to say they have obeyed orders superfluously this time. It is just that last stepping stone, ie Iran which will really tip the balance. How long can China and Russia stand by and watch America clean up? The great Russian bear and Chinese sickle will be roused from their slumber and this is when Israel will have to fight with all its might and weapons to kill as many Arabs as it can. Hopefully if all goes well, half the Middle East will be Israeli. Our young have been trained well for the last decade or so on combat console games, it was interesting to see the new Call of Duty Modern Warfare 3 game, which mirrors exactly what is to come in the near future with its predictive programming. Our young, in the US and West, are prepared because they have been programmed to be good soldiers, cannon fodder, and when they will be ordered to go out into the streets and fight those crazy Chins and Russkies, they will obey their orders. Out of the ashes we shall build a new society, there will only be one superpower left, and that one will be the global government that wins. Don't forget, the United States, has the best weapons, we have stuff that no other nation has, and we will introduce those weapons to the world when the time is right. " End of interview. Our reporter is ushered out of the room by Kissinger's minder. As you may have guessed by now, The Daily Squib is a satirical publication. Actually, please allow me to expand on what I mean by â€œsatiricalâ€� by quoting the websiteâ€™s footer, which states: â€œThe Daily Squib is a curious satirical publication and should therefore be taken f**ing seriouslyâ€�. As for the author, Alfred Heinz, well Henry Kissingerâ€™s full name is actually, Heinz Alfred Kissinger, so this is likely an alias. And I can only imagine that Al Ghad chose to use Global Research as the news source instead of The Daily Squib simply because the former sounds more respectable. Which it does. Actually, Global Research even made sure to prefix the headline of the article with the words: â€œACCURATE SATIREâ€�. They actually put it in caps just to emphasize that. Seriously. You can check it out. Heny lives in another dimension far removed from the common man. I can't stomach looking at this man, or hearing his scumbag royalist quips. Scum usually die in threes - Chavez went, hopefully Pissinger will be next, and then Castro. Can't we throw in one of the Bushes or Slick Willie instead of Castro? Well...but Castro is about ready to kick the bucket. Now that he is in a weakened state, he should be asked about this repugnant statement he made about AMERICAN SOLDIERS, and told to apologize! This would be the beginning of a long list of apologies this man owes the people!